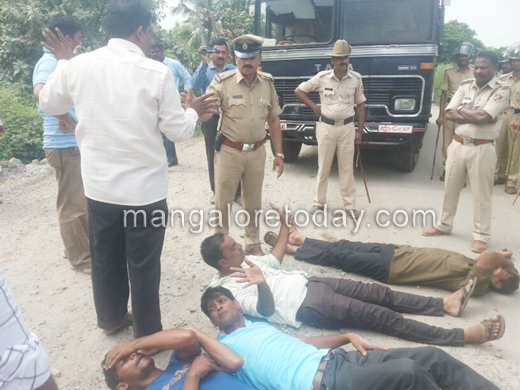 Mangaluru, Sep3, 2015 : Residents of Jokatte under the leadership of the Democratic Youth Federation of India staged a protest and thwarted the repair works of the approach road leading to SEZ on September 3, Thursday. The agitators led by Muneer Katipalla, District President of the DYFI protested by lying down on the road to obstruct the works. 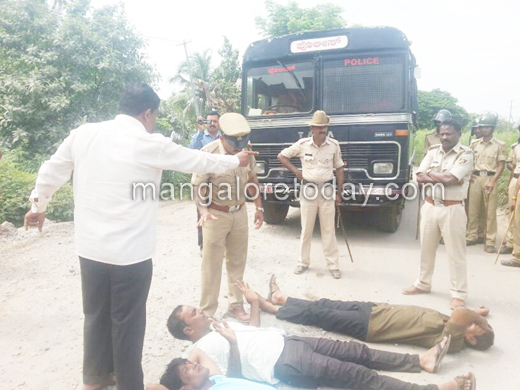 In fact Deputy commissioner AB Ibrahim had ordered to take up the repair works of the road and had even sought police security from the Commissioner during the works considering the several protests staged by residents of Jokatte against SEZ works. Accordingly the road works were scheduled to begin on Thursday amid heavy police protection when protestors arrived and began to stage a protest. As many as 18 protests including Muneer Katipalla and eleven women were detained by the police. Earlier, speaking to the media men present on the occasion, Muneer Katipalla said the works were initiated despite the appeal against taking up any work related to SEZ.